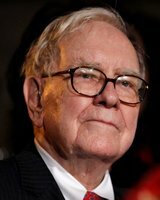 Warren Buffett 30 August 1930 American Howard Buffett Leila Buffett Actor, Investor, Financier, Philanthropist, Entrepreneur Business Magnate, investor and Philanthropist and the most successful investor in the world. He is the chairman, CEO and largest shareholder of Berkshire Hathaway and world's wealthiest people. A list of popular Hindi Warren Buffett quotes are given below.